When is land “used or occupied”? Do limited duration marriages come within the scope of the marriage power? An executor who fails to do his or her duty in a proper and timely manner is a nuisance to everyone. This article, which is the text of a speech given to a seminar held by the Law Society of South Australia in November 2013, highlights the problems, and notes how solicitors and the judiciary might deal with them. The theory of efficient breach holds that a promisor is free to breach a contract provided the promisor pays damages. This consequentialist approach to contract law ignores or downplays the availability of equitable remedies including specific performance, injunction and account of profits. This article explores equity’s role in the operation of the common law of Australia and the United States in providing contracting parties with recourse to compel performance where a counterparty seeks to breach. While all equitable remedies are discretionary, in a wide range of circumstances, these remedies amount to an obligation to perform in direct contradiction to the theory of efficient breach. 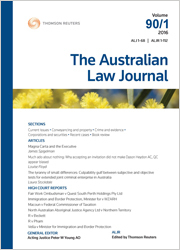 For the pdf version of the table of contents, click here: WAU – ALJ Vol 88 Pt 12 Contents.